VersaLogic announces BayCat—a rugged new PC/104-Plus™ Single Board Computer (SBC). Designing this exciting next-generation CPU into an SBC with the popular PC/104-Plus expansion provides additional options for customers using this versatile form factor. VersaLogic Corp., the embedded industry’s most trusted computer company, has announced “BayCat”—a rugged new PC/104-Plus™ Single Board Computer (SBC). Based on Intel’s highly successful “Bay Trail” System-on-Chip (SoC), BayCat combines high performance, low power consumption, enhanced security, and backwards compatibility with systems using PC/104-Plus ISA or PCI expansion. The BayCat’s powerful feature set, combined with a low-power draw and standard PC/104-Plus expansion, enables smaller, lighter and more energy efficient systems for intelligent medical, military, and industrial applications. BayCat is available in single-, dual-, and quad-core processor options to meet a variety of price / performance / application requirements. The BayCat provides compatibility with a broad range of x86 application development tools for reduced cost and development time. It is ideal for in-vehicle communications, medical devices, industrial automation, mobile autonomous systems, and other applications. The BayCat’s on-board Trusted Platform Module (TPM) security chip can lock out unauthorized hardware and software access. It provides a secure processing environment for applications in defense, medical, and industrial applications that require hardware-level security functions. Additional security is provided through built-in AES (Advanced Encryption Standard) instructions. Intel’s advanced Gen 7 HD graphics engine provides outstanding graphics performance and is capable of supporting up to two 1080p video streams simultaneously. On-board hardware acceleration is available for encode/decode of H.264, MVC, VP8, VC1/WMV9 and other standards. The graphics engine also supports DirectX 11, Open GL 4.0, full HD video playback, dual display support, and resolution up to 2560 x 1600 @ 60Hz. BayCat’s analog (VGA) and mini DisplayPort video outputs support two independent simultaneous displays including Extended Desktop and Clone modes. BayCat’s I/O connectivity includes dual Gigabit Ethernet ports with network boot capability, one USB 3.0 port, four USB 2.0 ports, two serial ports (RS-232/422/485), I2C, and sixteen digital I/O lines. A SATA 3 Gb/s interface supports high-capacity rotating or solid-state drives. A Mini PCIe socket with mSATA capability provides flexible solid-state drive (SSD) options. BayCat’s Mini PCIe socket allows easy on-board expansion with plug-in Wi-Fi modems, GPS receivers, and other mini cards such as MIL-STD-1553, Ethernet, and Analog. 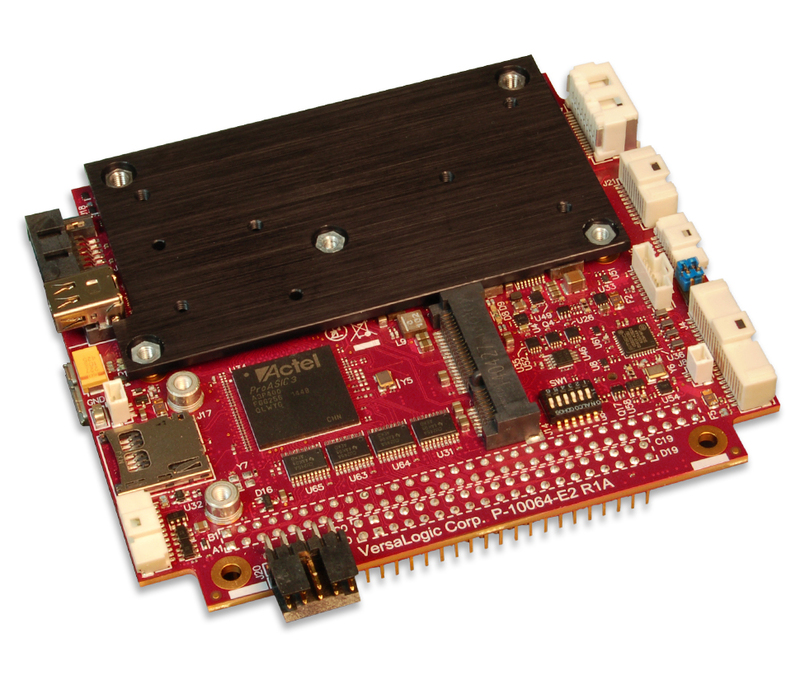 For stacking expansion using industry-standard add-on boards, the BayCat supports PC/104-Plus expansion, including ISA and PCI based modules. The on-board expansion site provides plug-in access to a wide variety of expansion modules from numerous vendors, all with bolt-down ruggedness. 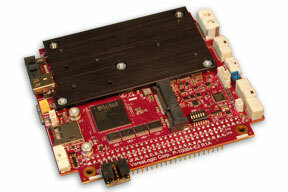 An SPI / SPX™ expansion interface offers additional plug-in expansion for low-cost analog, and digital I/O. The BayCat is designed and tested for industrial temperature (-40º to +85ºC) operation and meets MIL-STD-202G specifications to withstand high impact and vibration. Latching connectors and fanless operation provide additional benefits in harsh environments. The BayCat is covered by VersaLogic’s 5-year product warranty and 5+ year availability guarantee. VersaLogic’s Life Extension program typically keeps each technology generation available for 10+ years. Customization services to help customers create unique solutions are available for the BayCat, even in low OEM quantities. Customization options include conformal coating, revision locks, custom labeling, customized testing and screening, and more. The BayCat single board computer (EPM-31) will be available Q2 2016 from both VersaLogic and Digi-Key Corporation. Pricing starts at $752 in OEM quantities. Contact Sales(at)VersaLogic(dot)com or visit http://www.VersaLogic.com/BayCat for more information. VersaLogic Corp. built its reputation on very high reliability products and superior service. A 35-year history of consistency has earned VersaLogic the reputation of being the industry’s most trusted embedded computer company. VersaLogic delivers state-of-the-art embedded computers, coupled with expert technical support, for critical markets such as the medical and defense industries. For more information, visit http://www.VersaLogic.com.